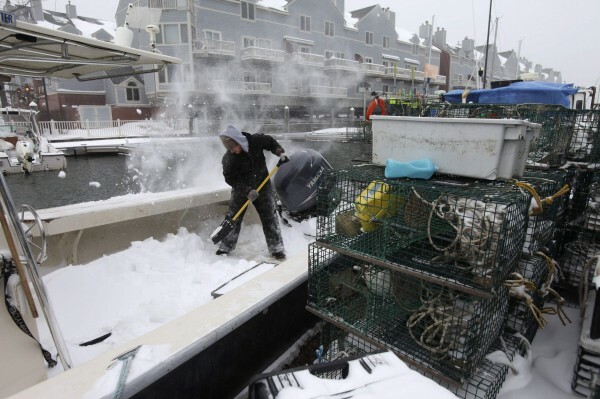 Rob McCann shovels snow off his brother's boat following a snowstorm in Portland on Dec. 15. GRAY, Maine — Aside from a few early snowfalls that quickly melted away, winter weather in recent years generally settled into a six- to eight-week period between January and March. This year, the state has had standing snow in many places since early December. Does that mean Mainers can expect their six- to eight-week winter penance to be paid a month earlier than in recent years? In fact, not only did the snow season start early, some forecasts call for it to end late. The Farmers’ Almanac, an annual Lewiston-based publication famous for its long-term weather predictions, foresees a wet snowstorm hitting Maine as late as April 16-19. If that’s accurate, the winter of 2013-2014 could be a record breaker of sorts. The longest snow season on the books — defined in this scenario as being the longest stretch of consecutive days in which there was at least an inch of standing snow — came in 1923 in Portland, when the city had 127 straight days of snow cover. In Bangor, the mark was set in 1944, when the Queen City spent 133 consecutive days under a blanket of the white stuff. That’s more than four straight months with snow. If an inch of snow lingers on the ground at least through what the Farmers’ Almanac predicts will be a final hurrah storm in mid-April, both cities will approach the 140-day mark with standing snow. Geiger said his publication is warning of late-season snowstorms on approximately March 4-7 and March 28-31 in addition to the mid-April blast, so there should be plenty of snow to keep the ground covered along the way. Curtis said that despite what she described as an annual snow season that has been “running a little late” in recent years, the National Weather Service agrees that the early arrival of regular snow doesn’t mean Mainers should expect an early arrival of spring-like weather. “But I don’t think you can say that since the snow arrived earlier, it’ll be gone earlier,” he said. Curtis said her organization’s three-month outlook for weather is turning up “normal” for the state, meaning that instead of an early thaw, Mainers will see winter weather continue plodding along at least through March — as is statistically normal in these parts. Portland averages 19.2 inches of snowfall in January, 12.1 inches in February and 12.7 inches in March. Bangor typically also gets 19.2 inches of snow in January, followed by 14.7 inches in February and 11.7 inches in March, Curtis said, so Mainers should brace themselves for numbers like those in the weeks and months ahead. “Really, when it comes to winter, the best thing we can say is that it ain’t over until it’s over,” she said. Rayno said the early cold and snow — and, potentially, by extension, the length of snow season — can be attributed to a stream of arctic air traveling from the northwest across Canada, then dipping down toward the eastern U.S. at around Alberta. “If you drew a line from where all of our air has been coming from in the eastern United States, you can trace it all the way back up to Alaska and the Northwestern Territories,” he said. Rayno said it’s difficult to pinpoint precisely why the arctic air — which is usually corralled much farther north in what’s known as the “polar vortex,” a term that has gotten more publicity in recent weeks as people have sought explanations for the recent stretches of bitter cold — is bending the way it is.